I never noticed or didn't pay attention before that the California State Parks website has a useful page that lists all the State Park campgrounds that take RV's and the maximum allowed length for RV's. Here are the links below. 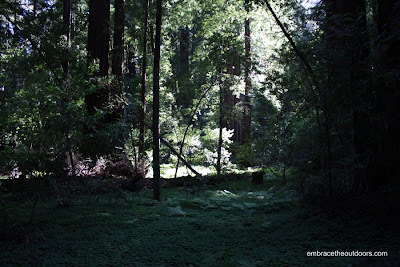 We camped for 2 nights at Henry Cowell State Park . This was our first visit ever to the park. Henry Cowell has 111 campsites for tent or rv camping, no hookups. Each campsite has the standard picnic table and fire pit with flush toilets and coin operated showers nearby. Bring your quarters for the showers, 25cents gets you 2 minutes. The layout here is similar to most state parks. Decent amount of space between most campsites and most sites have shade but be sure to check site details before reserving. Advanced reservations will be needed and are site specific. An interesting thing that I don’t think I have ever seen before is that several of the sites right next to the restroom had a back fence to them. I suppose to shield the campsite from the noise and add a little privacy. One important note is that alcoholic beverages are not allowed inside the campground. One of the first things you see as your drive in is about the no alcohol policy and you actually have to initial a paper about it when you check in. 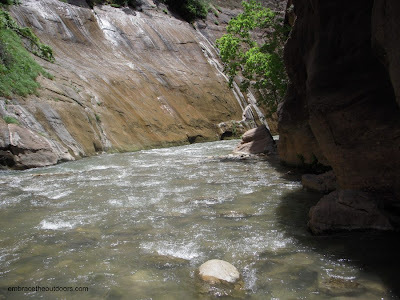 There is plenty of hiking here to do and you can always go and swim in the river. Also great hiking at the nearby Fall Creek Unit which is a short drive away. Be aware the trail to hike towards the visitor center from the campground is between sites 82 and 84 as the visitor center, gift store and day use are on the other side of the park. You may want a site near there if your planning to hike out that way. Poison oak is plentiful throughout the park so be careful. Firewood is available at the front entrance. You will occasionally hear the train from nearby Roaring Camp railroads. If you need ice or other supplies, you will be passing a Safeway on your way in on Graham Hill road, it’s only about 5minutes away. 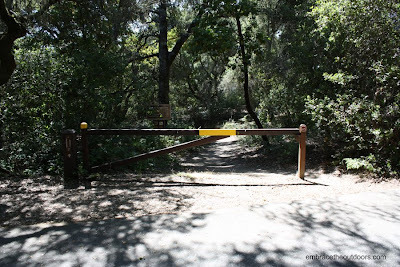 Also note that Henry Cowell has totally separate entrances for the campground versus the day use area. Campground entrance is on Graham Hill Rd. Overall camping here was great. Especially liked how easy it was to reach the park since its close to highway 17. On our second day of camping at Henry Cowell we drove to the Fall Creek Unit of the park for our hike. The parking area is a dirt lot just off Felton-Empire Road, we nearly missed it. This part of the park is not as well known. There were only a handful of cars when we set off on Bennett Creek Trail to Fall Creek Trail. 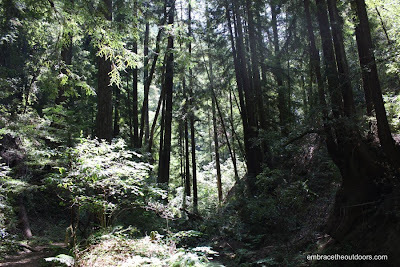 Our plan was to hike through the redwoods to see the old limestone kilns. Hiking along the creek was nice and peaceful, except for the bird that seemed to keep just ahead of us. 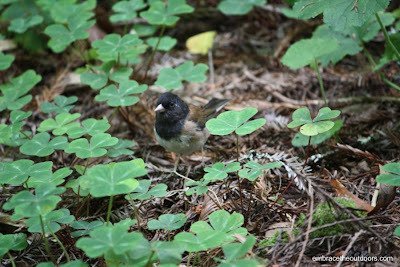 We ended up following that bird to Barrel Mill site, which used to be just that. 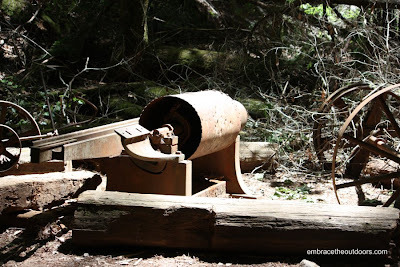 The site was used to transform redwoods into barrels used for limestone and you can still see some of the old rusted equipment. It was a great spot to take a break and imagine what the area was like 100 years ago when the mill was in use. 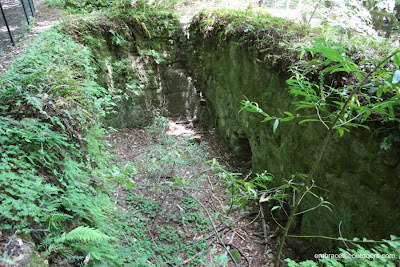 We headed back and took Kiln Trail to see the remains of the old limekilns, mainly remnants of the stone structures. 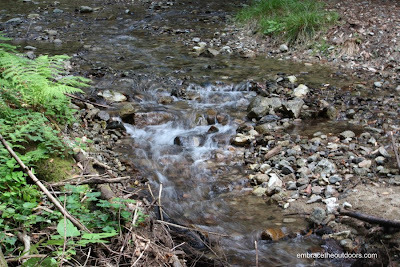 This was a popular site, we saw people resting on nearby benches, walking along the edge of the nearby creek and just enjoying nature. After some picture taking we headed back to the car. The hike was just under 5 miles. We started this 4.25 mile hike from the campground on our first day at the park, after setting up our site. The trailhead to Eagle Creek is between sites 82 and 84. 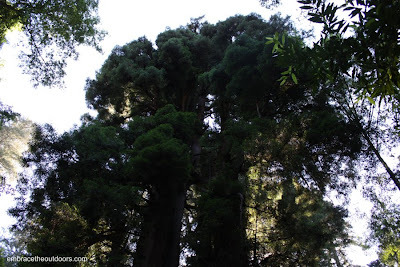 Most of the trail is shaded, as it passes through redwoods. We took Eagle Creek trail down to the river. It was a bit steep early on and then leveled out once we got to River Trail. 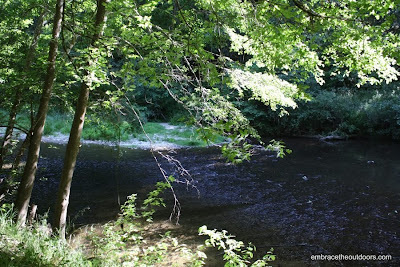 Once at the San Lorenzo river, we followed it towards the visitor center. We passed several opportunities to stop and take a dip in the water but didn't since we weren't prepared and were trying to make it back by sunset. 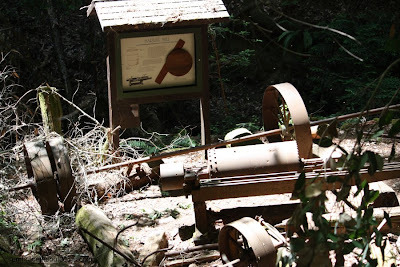 We continued on Pipeline Road (a paved fire road) and after making a brief stop at nature store, made our way to the paved Redwood Grove Loop Trail. The entire loop through old-growth redwoods and ferns is 0.8 miles. The loop was a nice stroll, and we saw some runners making their way around it a few times too. After the loop we headed back to our campsite. On the way back we could hear the sound from the nearby Roaring Camp Railroad and came across horses, as the trail is shared. 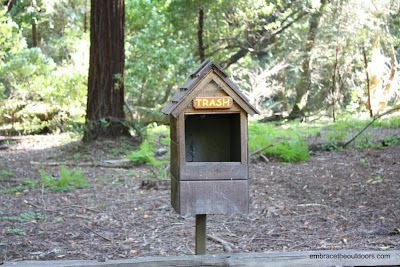 Demonstrate your support for our State Parks and have some fun! Visit your favorite state park and show your support by taking a picture while you are there of you and your friends wearing a green ribbon, wearing green or holding a sign you made or downloaded below! Your favorite State Park. If you can go camping, great. If not, then a day visit is perfect. If you can't make it to a State Park, then have an event in your front yard, backyard, or wherever you choose. This summer the National Parks service is having several fee-free weekends. 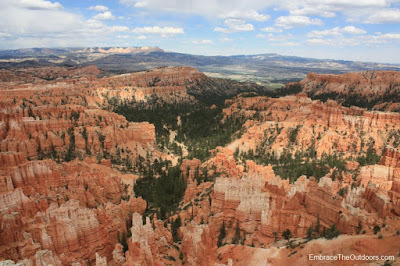 Not as many hiking opportunities in Bryce Canyon as in Zion. We decided to do a 3 mile hike on Navajo and Queen's Garden Trails. 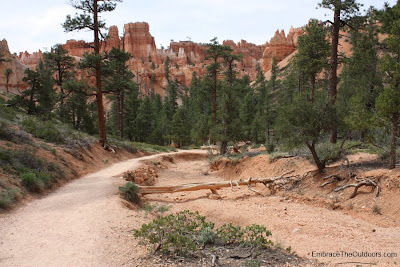 We parked at Sunset Point and walked a short distance to the Navajo Loop Trail. Quite a bit of foot traffic along Wall Street as the trail descended down into the amphitheater. Thankful we didn't start too early in the morning since it was still chilly. 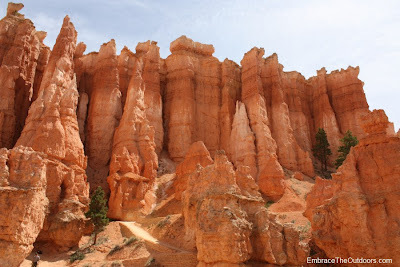 We made our way through the hoodoos and great views. Passed a few lonely flowers and critters along the way to Thor's Hammer, much more impressive in person than in a picture. We went on to Queens Garden Trail and stared and stared at Queen Victoria, a hoodoo that is supposed to resemble a queen, but we just couldn't see it. Found more peace and quite on this part of the trail as the sun started to beat on us. We made our way back up the 550 feet we had descended and ended at Sunrise Point. 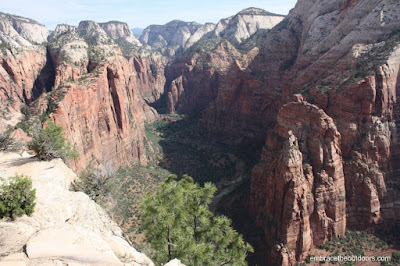 Just a short walk along the Rim Trail and we were back at our car. 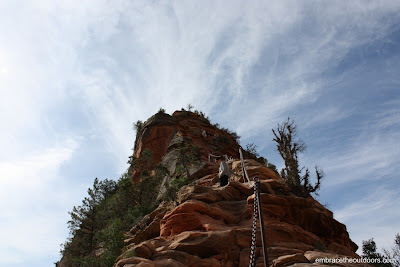 Our second day in Zion we decided to hike to the famous Angels Landing. 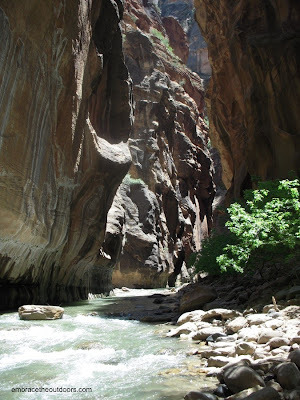 A hike that climbs nearly 1500 feet in 2.5 miles to a summit with grand views of Zion Canyon with the last half mile along a knife-edge ridge. We headed out early in hopes of avoiding the crowds and the heat. After taking the park shuttle to the Grotto stop, we started up the bridge and across the river to the West Rim trailhead. The trail starts climbing early on and most of it is exposed so we were thankful for the early start. 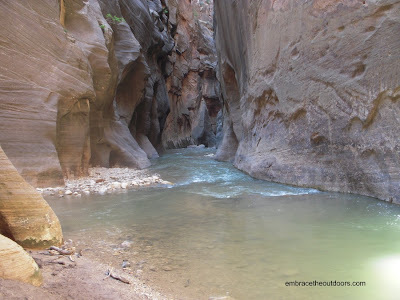 Before we had a chance to warm up too much we felt the air cool around us as we entered Refrigerator Canyon. Soon after we came to Walter's Wiggles, a set of 21 steep switchbacks initially carved out for horses, and found ourselves setting the pace for a small group behind us. 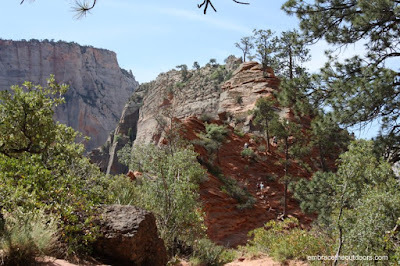 As the trail plateaued we came to Scout Lookout, a broad sandy area that serves as the junction of the Angels Landing Trail and the West Rim Trail. 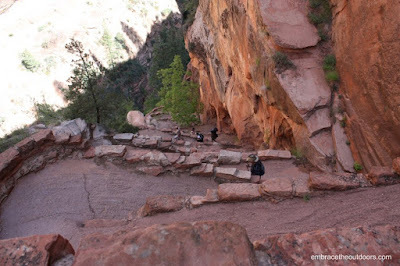 Most people head up Angels Landing Trail but this also serves as a turnaround point for those not daring to continue. The next half mile is the famous chain section that leads to the summit and follows a very narrow path. With a 1200ft drop off on one side and an 800ft on the other, we were thankful for the chains that helped guide us the rest of the way. There are spots where the trail is only a few feet wide. A good grip on the chains at all times was required. The chain section is only half a mile but looks very imposing as you gaze up at it. Hundreds of people do this hike daily without a problem. But an awkward slip could send you plummeting over the edge, so be careful. Once on top the views of the canyon were surreal. It wasn't too crowded at the top, thanks to the early start. After recharging our tanks and taking advantage of the photo ops, we headed back down the trail. As we stared down the sides of the cliff and headed down the chains, there were several people waiting to come up. In a matter of half an hour the trail had gotten much busier. Thank goodness we were headed back. 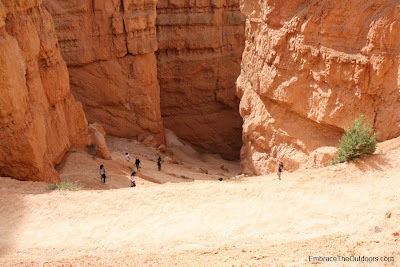 This trail is not for beginners and definitely not for anyone with fear of heights. 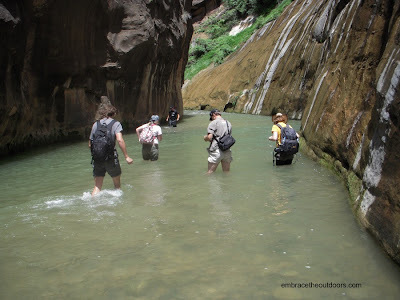 We recommend doing this hike as early as possible in the day because you do not want to deal with crowds while navigating the chain section.